Adventure is only a dice roll away. Role playing games are theater of the mind stories built around a group dynamic. The GM (Game Master) sets the scene, and the players explain what their characters are doing to change it. Posts regarding roll/role playing games and their various incarnations, rules, and options. Reviews, thoughts, personal House Rules and fun. Watch as RPGers actually play the games you are hearing about. Dungeons & Dragons 5E, Champions, Pathfinder and more. This is all about Galadria and the main realms of all our favorite RPGs. The truth is, while there's hundreds of this sort of websites, and rpgers that are out there, I wanted to add my voice to the choir. That is to say, I have things to say and might be heard by a new ear or two. Share your thoughts, critique mine, let's grow the hobby with open communication and free flowing ideas. Miniatures on a table, icons on a screen, or theater in the mind? World building vs campaign building vs character building. 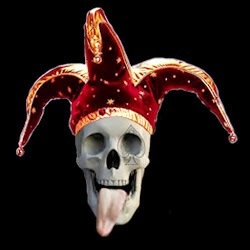 Freelyx is based on the idea of a jester. In days of old, jesters would tell royals everything they were doing wrong, but do it with humor and showmanship in such a way that they laugh at themselves, but they think about it. Copyright Bill Fortney Jr. and Freelyx.com. All rights reserved.